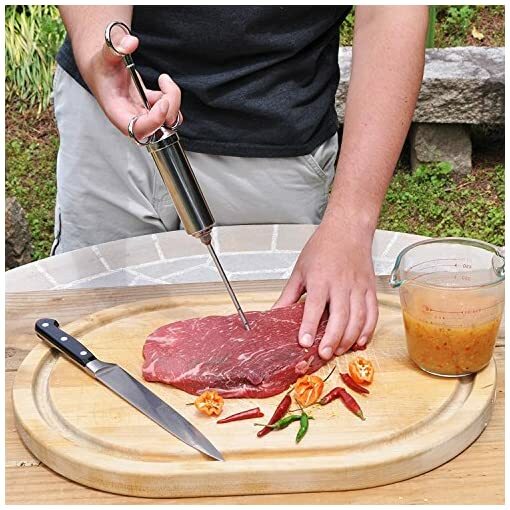 How many times have you prepared a roast turkey, BBQ’d steak or grilled chicken only to find it dry and flavorless? 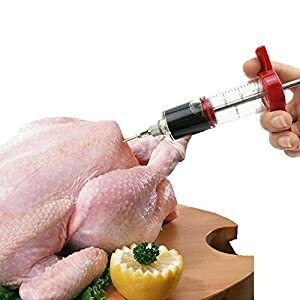 Now we have a easy solution, HiQi meat injector ensures you never have to settle for dry or bland food. Nor do you have to wait hours for little more than surface flavoring. 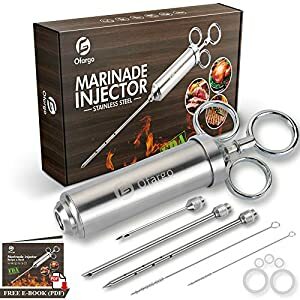 With a practical and functional design, the marinade Injector penetrates deep to deliver optimum flavor infusion throughout. 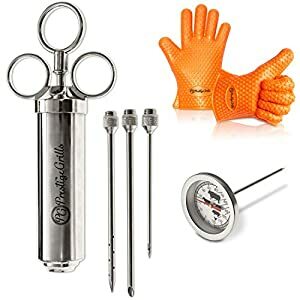 Easy to Use and Clean (Dishwasher Safe). 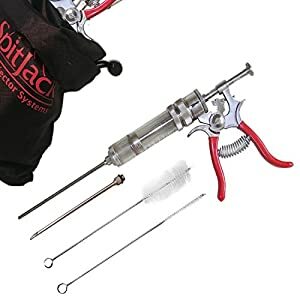 Penetrates even the toughest meats. 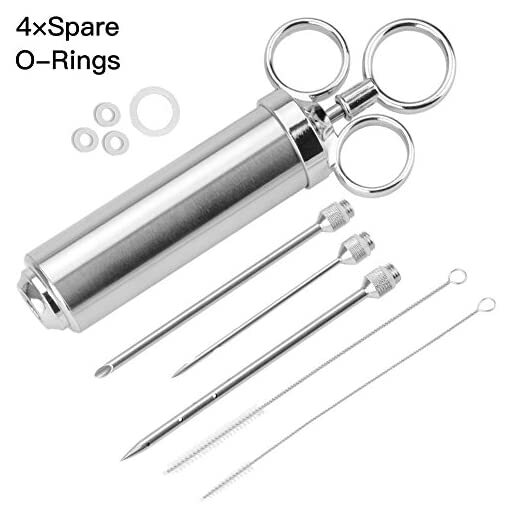 Used comfortably and easily. 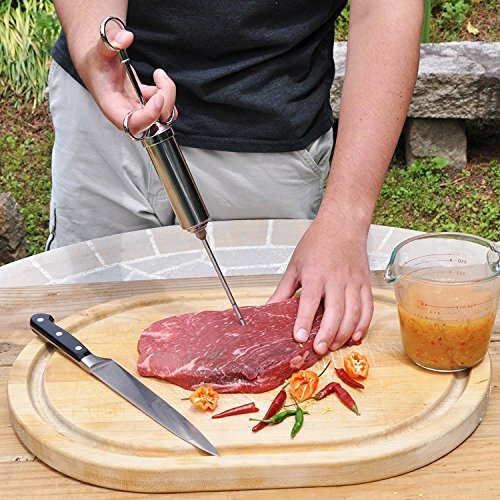 handle plunger offers a comfortable grip and friendly pressure control experience. 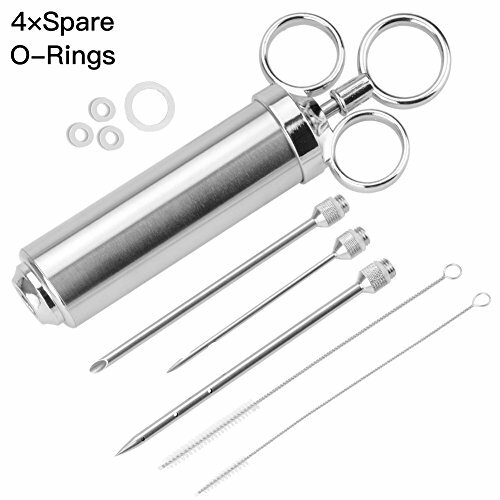 2-OZ large capacity syringe barrel minimizes refills. 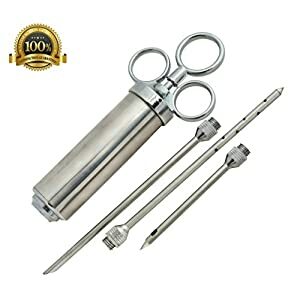 What’s the package included for Marinade injector syringe? 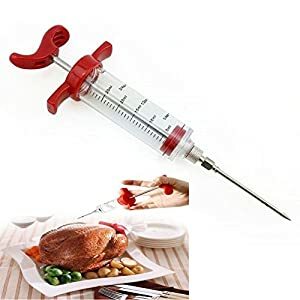 * Marinade injector needles are pretty sharp! KEEP OUT OF THE REACH OF CHILDREN! 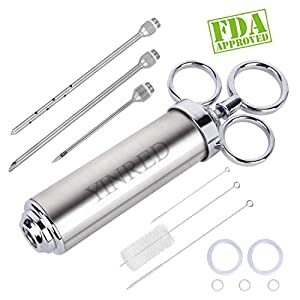 【100% SAFE & HEALTHY KITCHEN/ BBQ TOOL】Meat injector all components are FDA General Recognized As Safe: 304 stainless steel for syringe barrel and needles; BPA-free and FDA-compliant silicone material for seals; keep your family safe and healthy. 【EASY DISASSEMBLY & CONVENIENT CLEAN】: HiQi Meat injector with ergonomic threaded design, easy to assemble or dismantle. 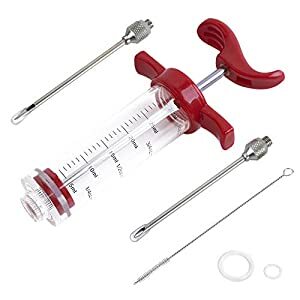 Just rinse the Peroom marinade meat injector in warm water or place it in the dishwasher after use, making cleanup super easy. 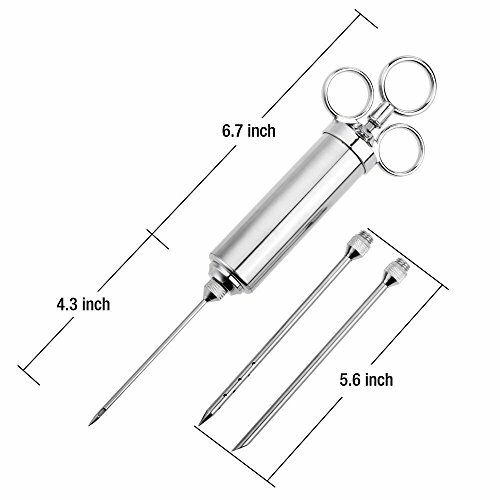 【THREE USEFUL MARINATE NEEDLES】: This Marinade meat injector package included one hole marinade needle for chunky and thicker meat such like turkey or steak,one 12 holes needle for liquid marinade,the precise needle is for smaller cuts of meat and more precision injector,satisfy different marinade demand. Two cleaning brushes easy clean for the needles. 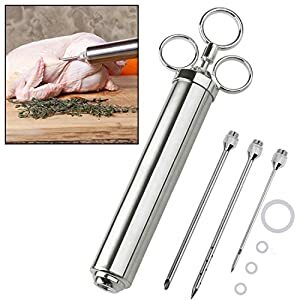 【Profession injector, Yummy for Every Bite】Our marinade injector is solidly built to last to intensify flavors of Thanksgiving , Christmas turkey, beef brisket, pork, lamb, chicken, goose, duck; practical for kitchen tools, holidays, BBQ, grill, family party, bonfire party! 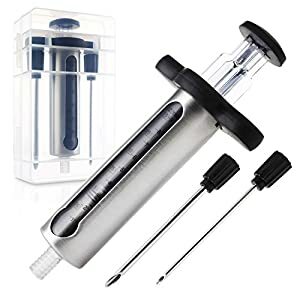 【A 100% MONEY-BACK GUARANTEE and LIFETIME WARRANTY】 Eliminate all risk so you can use marinade injector kit with confidence! Your complete satisfaction is assured.